One time can be a fluke, not that it was for Luol Deng when the Eastern Conference coaches sent Deng to his first NBA All-Star Game last year. But not twice; twice selected you are a star. So when Deng takes the court Sunday in Houston for the 2013 NBA All-Star Game, he will be one of the senior guys with a half dozen first time All-Stars on the Eastern Conference team, including teammate Joakim Noah. Luol Deng by official NBA definition is a multiple NBA All-Star. Deng always has had an easy smile, though too often locked tight in his early years with the Bulls and, really, until Tom Thibodeau became coach. Deng never much registered strong outward emotions, but often seemed to seethe with a quiet resentment toward his idea of basketball. In many respects, Deng was better, or at least had a more pure vision of the game, his game, than some of his coaches. Perhaps it was part of what he could not do compared with what NBA players were supposed to be, especially the stars, and Deng was supposed to be one, a lottery pick, leaving Duke after his freshman year following being one of the top prep players in the country. But Deng was a bit more the thinking man’s player, somewhat subtle in his moves. He didn’t make the highlight plays nor do anything in a particularly special or noticeable way. Which makes it much more difficult to get noticed when your teams are losing, or at least not winning that much like his Bulls teams before Thibodeau. It was in some respects almost an accident the Bulls drafted Deng. They liked him in college, but were overwhelmed by workouts when Ben Gordon came in and decided to use their No. 3 pick in the 2004 draft on Gordon. They were rebuilding with the loss of No. 2 pick Jay Williams in a motorcycle accident and had selected Kirk Hirnich No. 7 in 2003. The Bulls, though, felt they needed some veteran experience. So they acquired the draft pick from Phoenix to trade to Indiana for Al Harrington. The deal was close, but then Indiana demanded the No. 3 pick. The Bulls backed out and selected Deng No. 7. Deng struggled initially under the uncompromising demands of coach Scott Skiles, less so for the work load and basketball than Skiles’ rapier edge. Deng was not accustomed to the jabs Skiles could flick out about his play in a form of motivation Deng flinched from early. But Deng came on strong in his third season in 2006-07, averaging 18.8 points under Skiles excellent offensive schemes that featured Deng. Deng was starting to be looked upon as a potential star and his name came up in trade rumors for Pau Gasol and then even Kobe Bryant. Nothing ever was truly close. It seemed Deng was on the verge of that stardom. He didn’t have that one-on-one, classic NBA isolation game in which you beat your man, finish it off perhaps with a dunk and scream at the camera. Deng seemed to know where the cameras were as well, so he never looked that way, it appeared. He seemed to play a bit stiff, kind of upright and not with the athletic grace we usually associate with NBA magnificence. But Deng was perhaps more student of the game, if not life as well. We know his story, escaping the civil war in Sudan, a refugee in Egypt, suffering racism in Egypt and then being accepted in England, which he represents in international ball these days, in part, grateful the way his family was taken in. Deng is not one of the louder voices in the Bulls locker room, though certainly the greatest user of ice, his feet always in a bucket after games. He doesn’t seem to start the jokes and kidding, but joins in with an easy grace. You can see the other players look to him as a quiet leader, a position Deng certainly enjoys even as he’s not one to talk up too loudly. He does often on the court, but more in a cajoling, comforting and nudging way. Deng is fond every morning of writing a positive, uplifting note to himself or posting it on his Twitter account. The weather isn’t always gonna be how u want it, and things are not always gonna go your way. But it’s always a blessing to have a new day. Occasionally, they are quotes Deng might read. But more often they are his thoughts, feeling and notions that come to him as he prepares for another day. The Bulls now are that adopted family for Deng. It’s surely been an unusual and difficult journey from what is now South Sudan. Deng isn’t particularly revealing or expressive about those perils and hardships, reciting them for years in a matter-of-fact monotone. But that is, it seems, partly because he endured them somewhat that way as well, the way he’s been able to deflect the disappointments in his early career to emerge as one of the top 10 players in Bulls franchise history. Only seven Bulls have more All-Star appearances while Deng is tied with Jerry Sloan. Deng says his determined view comes from his parents, who were positive people despite losing high level jobs and having to run from the country. “It had a lot to do with the way we lived, moving around, being refugees,” said Deng. “I tell people what we went through and they say, ‘Oh, my god.’ Though it wasn’t like that because we were actually happy with each other. All the problems on the outside, not enough money for food or things, it did not matter because we laughed and enjoyed our time together and we always had this positive outlook. It’s been positive for Deng, leading the team in scoring this season with Derrick Rose out, third in rebounds and steals, fourth in assists, the best perimeter defender and the league’s playing minutes leader. It’s a role Deng has embraced and with the Bulls success continues to be noticed. Which is impressive because you usually don’t notice a player like Deng, who does little to ask you to notice him in this very me NBA/sports world. “Now when you look at the way basketball is going you don’t find too many players who move without the ball or cut or just are happy to play both ends of the floor,” says Deng proudly. “A lot of guys want to play one end and maybe step up on defense at the end. I know I enjoy playing both. My scoring is up a little bit this year because Derrick is not here. But I try my best to define to people that’s not who I want to be. If I can score and help my team win, I’ll do that. But I want to play into what the team needs. 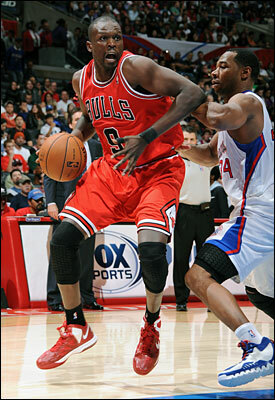 It is the true stuff of being a star, and Luol Deng is one of the special ones.